We live in Petal, MS. Sunday afternoon I was working on a post of how I made the zebra cake for Boo's birthday. My husband wasn't feeling well so we did not go to church so we wouldn't spread germs (we thought he had the flu) to the other members. It was raining on and off during the day and we were under a sever thunderstorm alert. The weather app on our phones went off telling us we were under a tornado watch. We turned on our TV and saw that it was almost immediately upgraded to a warning and it was just one town over from us. We gathered our girls and dogs and put them in the closet (I should note they were not afraid and were quietly playing their DS games, this was not the first time they had to go in the closet for weather). We continued to watch the TV to see where it was headed, when the cable and then power went out. 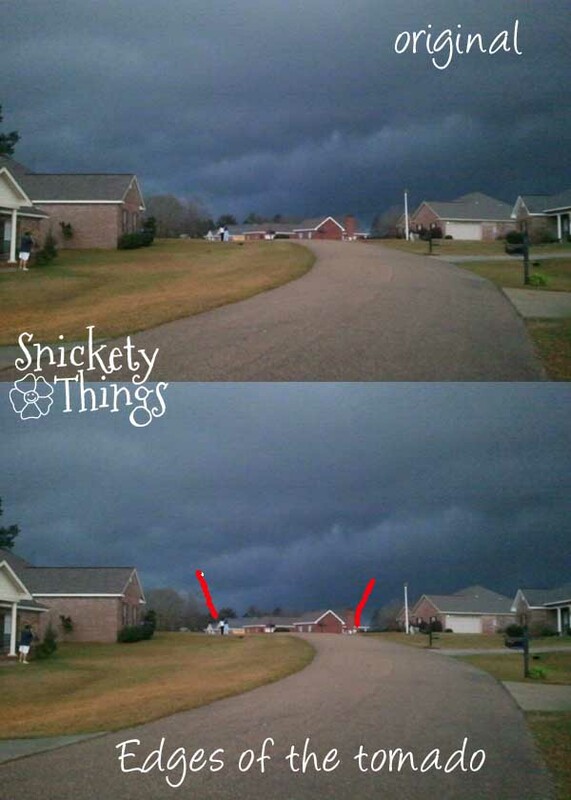 We had no idea where the tornado was headed but towards our town. I went out the front of the house and Jeff went out the back to keep an eye out, and so we could head to the closet if needed. I could see very dark clouds in the distance, but there are a lot of trees around so it was a little difficult to see. Our neighbors were doing the same thing we were. 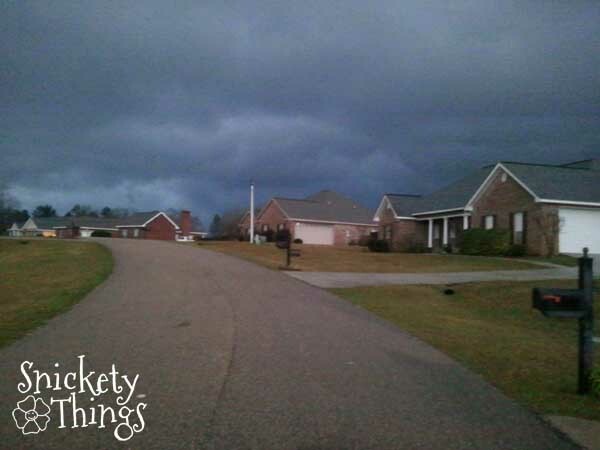 Here is a shot of the dark cloud rolling in. 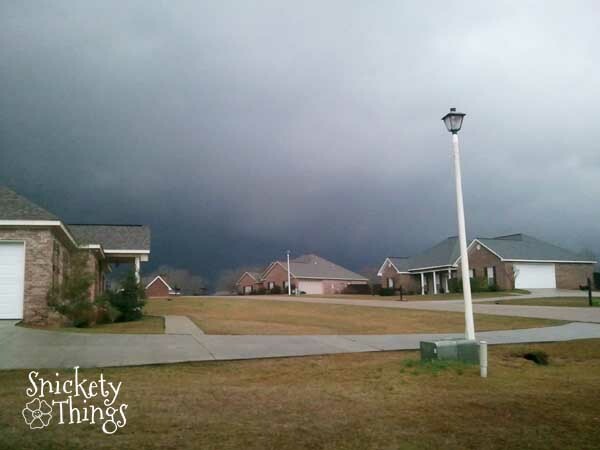 Just a few seconds later we saw the tornado going by a little over a mile from our homes. Can you see the edges? Here is a shot that shows where they are in relation to this picture. Then, relieved, we watched it move off. You can see the back edge just between the farthermost houses. Having no power, cable or internet, we did not know what happened. I immediately called my parents who live a bit closer into town and found they were okay. My sister and her family had gone to church and I was relieved when they pulled into our driveway. We were without power until late into Sunday night and did not get cable or internet until last night. Monday Jeff wanted to go by his work because he had a meeting so we went with him, hoping to connect to the internet there to get a little info. On the way we found out just how bad the storm was (our info so far was through Facebook on our phones and texts from people outside our area). Late in the night we got called by the school district telling us no school for Monday. This is what we started to find as we drove. 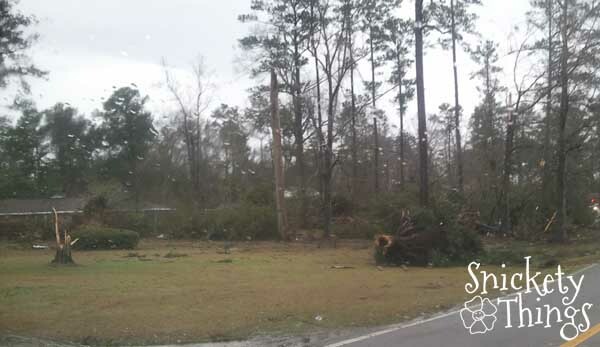 Trees were just twisted right off and put down farther away (the trunk is on the right and the tree is by the road). This is smaller tree, but the larger ones were not any better, just sheared a bit farther up the trunks. We live in an are with a lot of the tall pine trees like the ones you see in the above photo. Many along the path are now missing tops. What I have not posted are pictures of destroyed homes through here. This pictures is just a little less than half a mile from my parents' home. We started seeing a lot of debris in the trees. 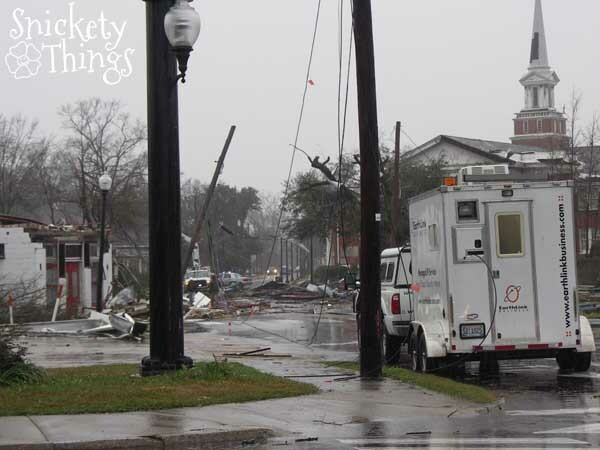 We were even more heartbroken as the damage continued to get we got closer to town. This used to be a hardware store on Main Street. 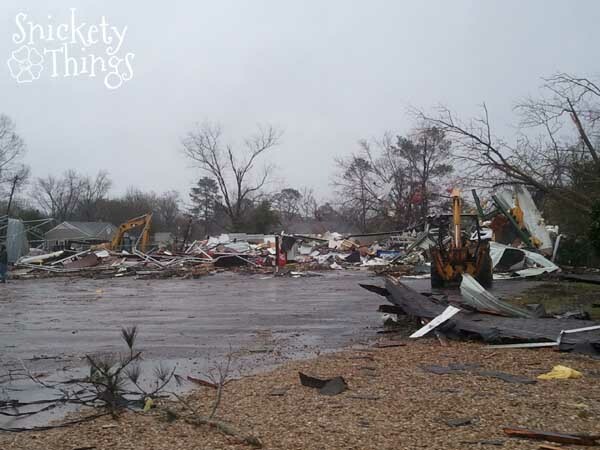 This is about 1000 ft from our church (our church was not damaged). 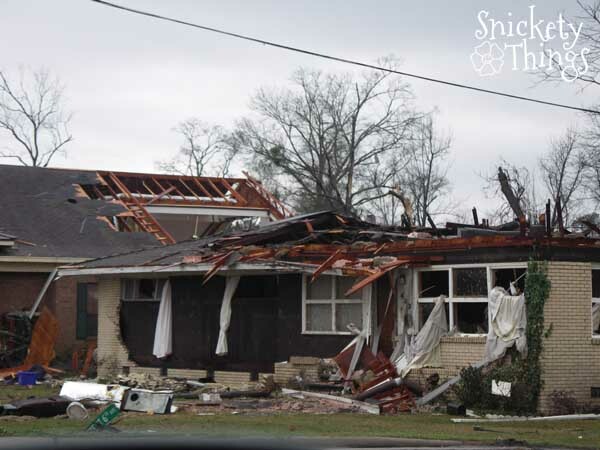 Many houses around here were destroyed or heavily damaged. Here are the stores across the street. 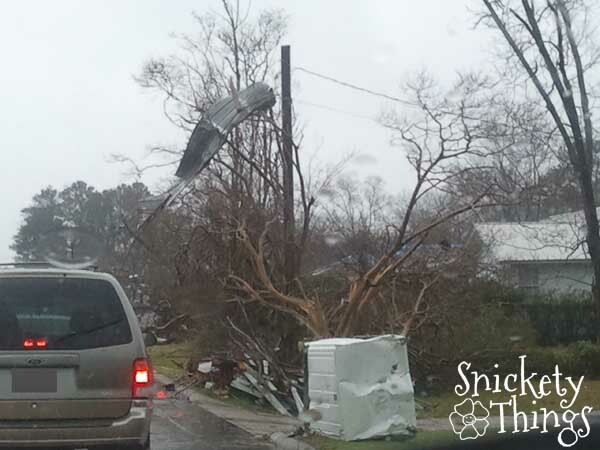 Going into Hattiesburg we found more damage. It was not easy to find a way to get where we were going. We could not even get on to one of the main roads in Hattiesburg. We had to make our way around. 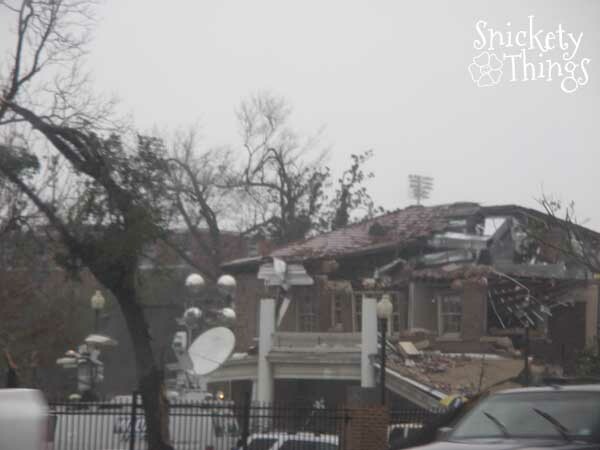 It was sad to see the Alumni House at The University of Southern Mississippi had been heavily damaged. Other buildings on campus were damaged badly also. After getting to Jeff's work, his meeting was cancelled so we just gathered the info we could and headed back home. We took a quick drive by our girls' school to see how it fared as it was in the path. 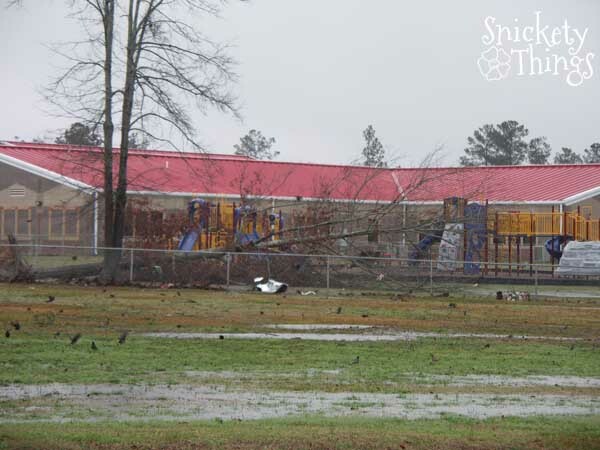 Houses across the street from and behind the school were damaged, but the school itself looked intact. Only debris and downed trees on the playgrounds. What we saw at homes everywhere we went were people coming together to clean up even though our rain has not yet ended. I watched my friend's daughter so she and her son could go help with clean up efforts in the afternoon. Here is a video taken by storm chasers in the area. The video shows the same stretch of road twice, with two different cameras. The damage they stop at is the University where the road is now closed. 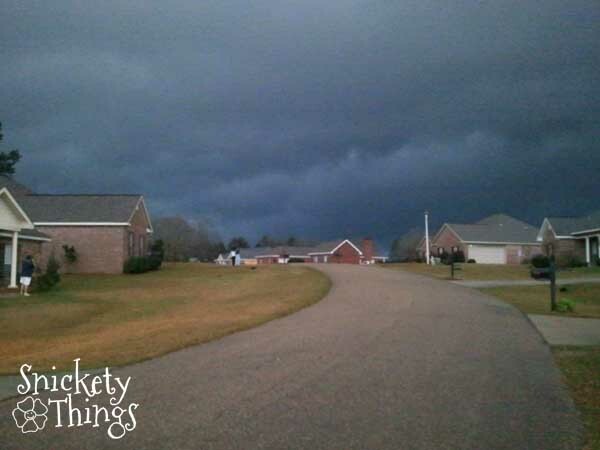 This is taken in Hattiesburg. Thankfully, there have been no deaths reported. Please pray for the families here who have been affected. Go to the Mississippi Red Cross site and donate to the relief efforts in Forrest and Lamar counties. Our local Red Cross office was destroyed along with their recovery trucks, but they are still helping people. I'm so glad y'all are OK!! On a lighter note, the place between the gas station and the music building is/was a donut shop now? I swear, that place changes hands so much! From Coop Deville to whatever BBQ place to donuts....all within 10 years. Love you! That place changed a lot when I was there, too. Thanks for checking on us after the storm! I will never complain about snow again...Well at least not for the rest of the year! I'm so glad you and your family made it through. Thanks Jenny. They are still rebuilding now, but it is getting close to normal.